A massive environmental catastrophe almost devastated the coast of Alaska today when a tanker carrying 11 million gallons of oil collided with another ship in the Cook Inlet. 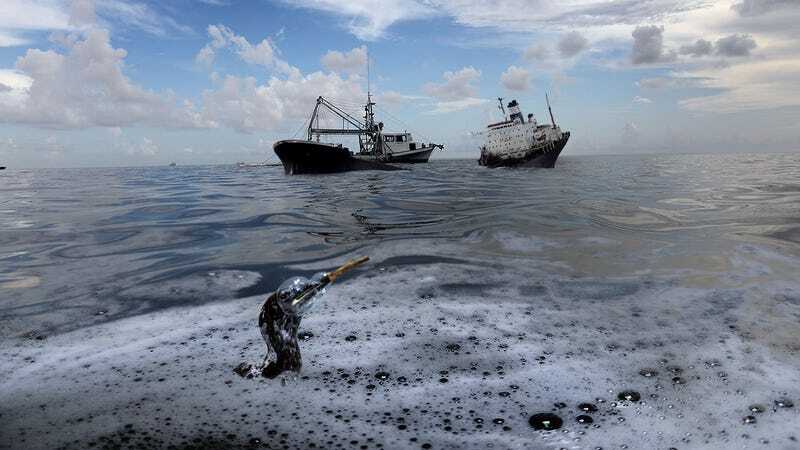 The ensuing oil spill seemed like it was going to decimate local wildlife populations, but luck intervened: The ship the tanker crashed into was carrying 11 million gallons of Dawn dish soap, and the two spills basically canceled each other out. Wow. It’s incredibly fortunate that the oil tanker ruptured the hull of a tanker hauling Dawn soap, because that oil could have been really bad for animals otherwise. Witnesses say that the coastline was covered in thick, gooey black crude oil for a few seconds before the mess was dispersed by a lemony-fresh wave of Dawn soap that left the shore as clean as it had been before. Sea otters, eagles, and other creatures that had been momentarily flopping in the muck and gasping for air stood up perfectly fine, shaking the sudsy water off their bodies, and continued on with their day like nothing had happened. Experts have pointed out that without the corresponding Dawn spill, the oil would have devastated the region for a decade, and likewise without the oil, a spill of only Dawn soap would have similarly destroyed flora and fauna for years, so it’s incredibly good luck the two massive ships happened to run into each other. Thankfully, this potentially catastrophic incident had absolutely zero impact on nature, but this is a wake-up call that oil tankers may collide with things but might not always hit a barge full of Dawn soap. Perhaps our lawmakers should enact laws to ensure that ships that carry oil also have to carry the same amount of Dawn soap onboard in a 50-50 ratio, so spills always solve themselves. That way all oil spills can be as completely inconsequential for wildlife as this one was.